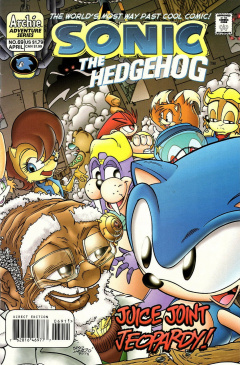 Sonic the Hedgehog 69 is the sixty-nineth issue of the Sonic the Hedgehog comic. This issue features two stories, the main story, titled "A Day In the Life" and the back-up story, titled "Tales Of The Freedom Fighters - Part Three - Weathering The Storm". In the restored Kingdom of Acorn, within its capital city, Mobotropolis, the Kingdom's Queen, Alicia, has returned home. Unfortunately, she has returned asleep indefinitely within the confines of a medical stasis system built by the Brotherhood of Guardians. The system is the only thing that has kept her body alive for the past decade. Also returned is Prince Elias, King Max Acorn's eldest son, and brother of Princess Sally. The three surviving members of the royal family look upon the Queen as technicians and doctors set up her life support system. Sally takes the opportunity to ask her father why her father would keep the existence of an older brother a secret from her. The King replies by telling her that she was too young to even remember Elias; her mother had apparently perished in an attack by the Overlanders, he only wanted to spare his daughter from the further pain of losing a brother. When new evidence had emerged that her mother and brother had in fact survived the attack and subsequent crash, he sent his loyal Secret Service Agent Geoffrey St. John to Angel Island to discern truth from rumor. He points out that rumors can be harmful, and that by not telling her of recent developments he was keeping her from gaining a false hope. When St. John's mission met with success, he knew he had done right. He apologizes for having placed the burden of leadership on her young shoulders, announcing that on the day he descends from the throne, it will be Elias who ascends instead of Sally. This knocks both his children for a surprise. Just outside the castle, Sonic the Hedgehog is telling his friends all about his exploits around the world alongside Miles Tails" Prower. Unbeknownst to Sonic and his compadres, they are being watched from the shadows by a set of figures in trenchcoats. It seems someone's reappearance in Mobotropolis after all these years has piqued their interest. Sonic and crew meet up with Nate Morgan, who has come to the conclusion that returning to the city with Sonic and Tails was the correct one. Even though the city is forever scarred by the actions of Julian Kintobor, just seeing the look of joy on Max's face upon seeing Nate again makes him happy to be back. They meet up with Sally, who cheers up at the moment she spots Sonic. Doctor Quack observes that this is the first smile he's seen the princess have all day, perhaps she should go with Sonic and her friends and enjoy the day. Sally doesn't want to, not while her mother is still so sick, but the King steps in and tells her that she should trust the doctor. She should start having fun and show her brother and Mr. Morgan around the city. Elias politely declines, his excuse saying that he's been so tired by recent experiences that he needs to rest, and leaves. Sonic quietly wonders what's up with Sally's brother. Soon after, they walk the bustling streets of the city, still ignorant of the fact that they're being watched. Sonic tries to cheer Sally up by stating that he thinks it's awesome that she has a genuine long-lost brother, but Sally's unenthusiastic reaction gives him pause. They stop at a chili dog stand, giving Nate Morgan his first taste of the "Food 'o' the 'hogs". They enter a juice bar, where a group of Mobians are having a good time. Nate Morgan notices that his appearance seems to be drawing a bit of negative attention, suggesting that he leave while the others enjoy the bar. Sonic nixes the notion, not accepting the idea of judging an individual based on the actions of a race. A few drinks and laughs later, and they're all having a good time. Sonic pulls Antoine D'Coolette aside for a chat, starting by noting how much of a liking Bunnie Rabbot has taken to him. Antoine waxes poetic over her, to which Sonic interrupts by saying he catches the drift. He changes the subject, by noting how there have been many happy reunions of late. Antoine agrees, and questions whether he'll ever be able to know the fate of his father, General D'Coolette. Sonic tries to break the news of Antoine's father, about him being a robotized despot in Deerwood Forest, as gently as he can to his coyote friend. Bunnie witnesses from not to far away how glum suddenly Antoine looks. She's about to do something, when a commotion occurs. A panda has take the opportunity to express his opinion of Overlanders by dropping a glass of juice over the head of Nate Morgan. As he's about to walk out, proud of what he's just done, Sonic stops him. Sally pulls Sonic away, allowing the panda to exit without incident. Not to far away, the figures in the treachcoats get ready to make their move. Back at the juice bar, the trenchcoat stalkers have made their move. They surround Sonic and the gang, demanding they hand Nate Morgan over, or else! Sonic declares that no one touches Nate, and gets grabbed by his throat for his efforts. Sally rushes to his aid, only to get knocked unconscious by a blow to the back of the head from a hammer. Sonic breaks free with a spin, and runs to pick her up. The stalkers reveal themselves to be the escaped prisoners, and the battle commences. Nate is abducted by Predator Hawk, while Rotor is accosted by Drago Wolf. Antoine is surrounded by Lightning Lynx, while Bunnie is tripped up in a web by Arachnis. With their mission accomplished the gang escape, Sargent Simian tossing a grenade behind him for cover. Lupe and her Wolf Pack have taken temporary shelter in the abandoned city, as the weather worsens. They are rationing their supplies while trying to find more, as Lupe decides what to do with the recently discovered Overlander sisters. She considers adopting them, to the dismay of her second-in-command. Supplies are already low; taking on the Overlanders would make surviving more difficult. Lupe points out that abandoning them would make her kind no better than those they had previously fought. The two find food, return to the others, and make dinner. Lupe formally announces her decision to adopt the girls. She will teach them their ways, and they will be treated as one of their own. As she looks upon her clan, she sees hope. Hope for the future. Hope of finding other members of the clan. This is Queen Alicia's first appearance in Sonic the Hedgehog, albeit inside a suspended animation chamber.